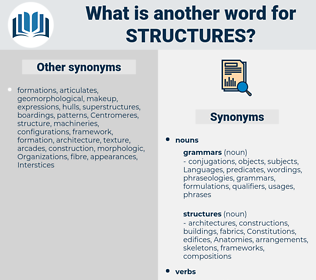 What is another word for structures? architecture, infrastructure, infrastructures, fabric, fabrics. substructures, architectures, configurations, frames, vessels, architecture, infrastructure, infrastructures, fabrics. sectors, Houses, councils, NGOS, vessels, Companies. features, Entities, rates, existing, material, enterprises, infrastructural, S, references, series, des, government, vessel, vessels, Undertakings, engineering, types, venue, craft, Boats, industry, eu, plant, competition, library, titles, health, Companies, river, european, reading, regional, iaea, union, joint, composition. 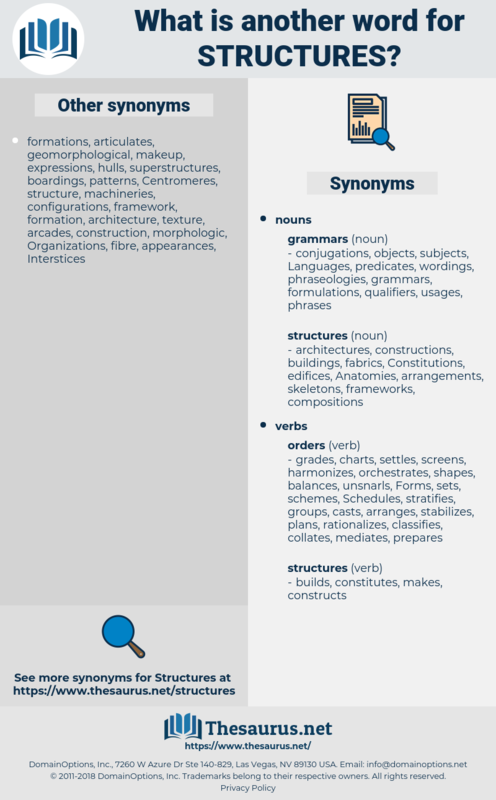 conditions, mechanics, assets, terms, provisions, operations, Constructed, circumstances, Measures, increased, characteristics, construct, constructs, stores, courses, purposes, elements, reconstruction, procedures, services, centres, centers, systems, years, Resources, sources, Apparatuses, credentials, matters, shapes, designs, arrangements, ways, methods, Hierarchies, instruments, sites, streams, stakeholders, shelters, decision-makers, cadres, components, proceedings, results, Regulations, aspects, policy-makers, sectors, settings, scale, Scales, processes, presences, policymakers, papers, bridges, counterparts, schemes, materials, built, outcomes, sections, projects, times, model, Studies, means, documents, premises, ouvrages, accommodations, locations, traces, spaces, chapters, parts, jurisdictions, administrations, formations, arranges, products, Forms, Areas, remains, Schedules, objects, approaches, amenities, interests, charts, aircraft, FORMATS, segments, Houses, devices, instances, pieces, channels, organises, monuments, sets, networks, functions, piles, boards, writings, presented, shells, Dependencies, cases, Schemas, housings, UBWS, installations, jobs, Governments, levels, schematics, relics, dwellings, Adjustments, regimes, workings, improvements, cooperation, positions, laws, courts, forces, commitments, Capacities, decisions, settlements, Operators, contributions, professionals, executives, Associations, platforms, Branches, Assemblies, ruins, Investments, texts, things, humans, Foundations, Entries, orders, tariffs, weirs, Textbooks, Capabilities, pillars, depths, Properties, cartridges, presentations, topsides, Installed, thanks, lists, cultural, passages, PATHWAYS, themes, modes, makers, Keys, tables, outfalls, tools, plans, community, Communities, Plants, Journals, Activities, packages, Cribs, Industries, compounds, volumes, Bureaus, markets, Policies, diagrams, kinds, powers, modules, editions, corporations, Fees, Booklets, Businesses, expenses, players, developments, Vehicles, modalities, groups, caps, fittings, items, Ones, marks, Firms, reforms, ranges, agents, machines, points, findings, committees, Abilities, CRA, Ships, piling, providers, employers, traits, hands, data, actors, Bases, manuals, holding, homes, departments, managers, avenues, landmarks, zones, Trainings, changes, spillways, place, places, dams, vision, derivatives, outputs, appliances, wheels, readings, annexes, crossings, Programs, officers, forum, Forums, Fora, Missions, Schools, utilities, beings, launch, racks, mountings, HOS, programmes, tribunals, choices, Parties, guys, handbooks, offices, controls, organisms, drawings, councils, NGOS, Sons, officials, monographs, features, Entities, rates, existing, goods, enterprises, references, LINEs, Undertakings, types, Boats, titles, Companies, reading. The other structures of the skin not shown. When completed, it was certainly one of the noblest and largest structures in the kingdom.